The country’s largest fast-food chain continues to spread joy everywhere, even on the road! 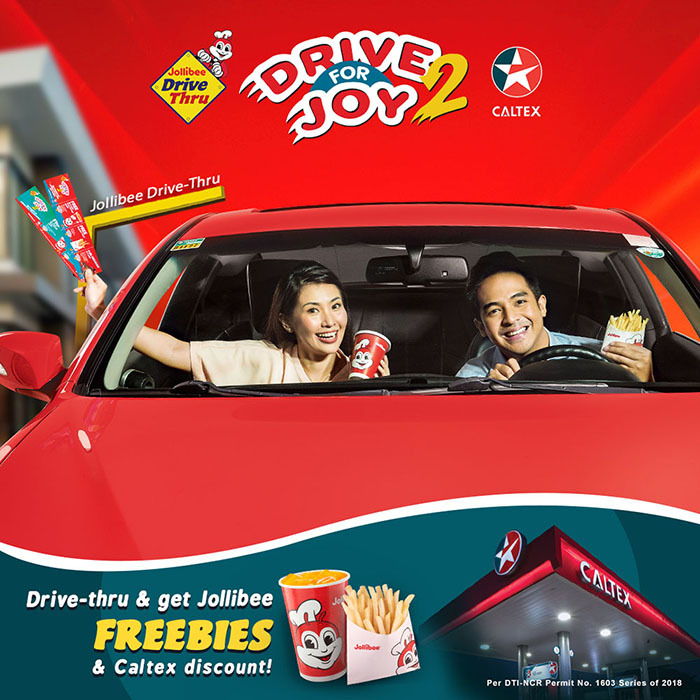 On its second year, the “Drive for Joy” promo gives even more exciting redeemable freebies and discounts to customers who order their favorite treats at Jollibee Drive-Thru stores or people on-the-go who gas up at Caltex retail stations nationwide. Every P150 minimum single-receipt purchase gives Jollibee Drive-Thru customers a coupon which entitles them to a free Go large orange juice when they buy any value meal, and free regular fries which they can avail with a minimum spending of P200. Both are redeemable through Jollibee Drive-Thru transactions only. They also get a stub which entitles them to a P1 per liter fuel discount that they can readily avail at any participating Caltex gas station. Every P500 single or combined gas-up receipt at any Caltex retail station also gives drivers and motorists a Jollibee coupon which entitles them to a free Go Large orange juice when they buy any value meal, and free regular fries every time they spend a minimum of P200. Both are redeemable through Jollibee Drive-thru transactions only. So, hurry, drive for joy to your next food stop at any Jollibee Drive-Thru store or go for a fuel stop at any Caltex gas station nationwide to avail of the freebies and discounts. Promo runs from October 15, 2018 to January 15, 2019 only. See posters and print ads for details (Per DTI-NCR Permit No. 1603 Series of 2018).